What better way to attract attention in Nairobi, Kenya? Hold up traffic and play loud music. Last week, WorldLoop had the opportunity to join the WEEE Centre in an effective community awareness raising and e-waste collection campaign. What did this entail? For starters, there was a flatbed truck fully equipped with six large speakers, a DJ, a handful of staff members of the WEEE Centre’s telecom partner Safaricom and a local celebrity MC’ing the entire affair. Following behind the rocking truck was one of the WEEE Centre’s collection trucks. 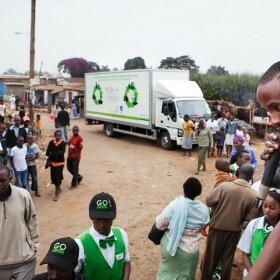 The “Go Green” entourage slowly made its way through the streets of Nairobi, playing music, dancing with the MC yelling out stats on e-waste and responsible consumerism all in Swahili. After an hour or so, the trucks headed for one of the local slums where they stopped and set up a mobile collection point. Local residents were encouraged to drop their old broken electronics in one of the WEEE Centre’s collection boxes for a chance to spin the prize wheel. While collection volumes by way of weight were low, turn-out and number of assets collected was quite high. The WEEE Centre ran this campaign every weekend for five weeks, driving awareness of the dangers of e-waste to those communities most impacted by the hazards.